Women of all fitness levels, sizes and ages are gaining great results with The San Jose Boot Camp! You can too! Are you looking for a jump-start to your fitness program? Then this adventure is for you! Whether you are a beginner, an avid fitness enthusiast or just tired of the same routine come try this whole new approach to exercise...fun! San Jose Adventure Boot Camp is an indoor fitness program that offers fitness instruction, nutritional counseling and motivational training - packed with fun and energizing activities designed to help you reach your fitness goals in a great outdoor fitness program located conveniently in the San Jose, Campbell, Almaden, Los Gatos, South Bay Area. Whether you want to lose weight to fit into that special dress, shed the extra pounds from a pregnancy or just get fit before that special occasion, this is the program for you! Register now for the next Adventure Boot Camp and you will love it so much that you too will be hooked on the best morning workout the Silicon Valley has to offer! Register TODAY for San Jose/Campbell/Los Gatos/Willow Glen/Almaden Valley's Top Fitness Program, San Jose Adventure Boot Camp for Women! "Come join us for the best fitness program of your life! We have a fun time getting into shape, and you CAN achieve your fitness goals with San Jose/Silicon Valley Adventure Boot Camp! We want to help!" Brett A. Riesenhuber BS, CPPT, FMS, MBS, CABCT. 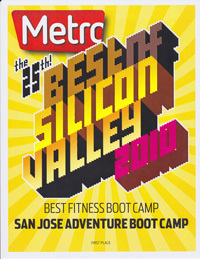 Our fitness Programs include: san jose boot camp, san jose adventure boot camp, weight loss boot camp san jose, adventure boot camp san jose, adventure boot camp, boot camp Almaden, Almaden Boot Camp,Milpitas Boot Camp, Santa Clara Boot Camp,boot camp willow glen, boot camp Campbell, boot camp San Jose,Silver Creek Boot Camp, Morgan Hill Boot Camp, boot camp Los Gatos,Los Gatos Boot Camp, ultra boot camp, fitness, women's fitness, exercise specialist, san jose's top fitness professional, diet and nutrition, fitness consultant, bbot camp, fitness training program, boot camps in california, military workouts, fitness camp, bootcamp fitness, women only exercise, bootcamp, boot-camp, bay area boot camp, fitness boot camp, boot camp training, boot camp fitness, bootcamps, fitness bootcamps, personal training and much more!